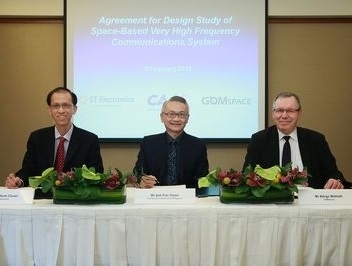 GomSpace together with the Civil Aviation Authority of Singapore (CAAS) and Singapore Technologies Electronics Limited (ST Electronics) have signed a research collaboration agreement on the sidelines of the Singapore Airshow (6 - 11 February), to conduct a design study on the implementation of space-based Very High Frequency (VHF) communications for air traffic management (ATM) in the Singapore Flight Information Region (FIR). This agreement follows the signing of a Memorandum of Understanding (MOU) by the three parties in July 2017 to explore the application and deployment of the space-based system. The space-based VHF communications system involves the mounting of VHF communications equipment onto a constellation of small low-earth-orbit satellites to enable clear and real-time communications between air traffic controllers and pilots over oceanic airspace.This technology will improve safety and facilitate the safe reduction in separation between aircraft, from the current 80 nautical miles (NM) to potentially 5NM, in airspace where ground-based VHF communications is currently not available, increasing ATM capacity and enabling more efficient use of airspace.